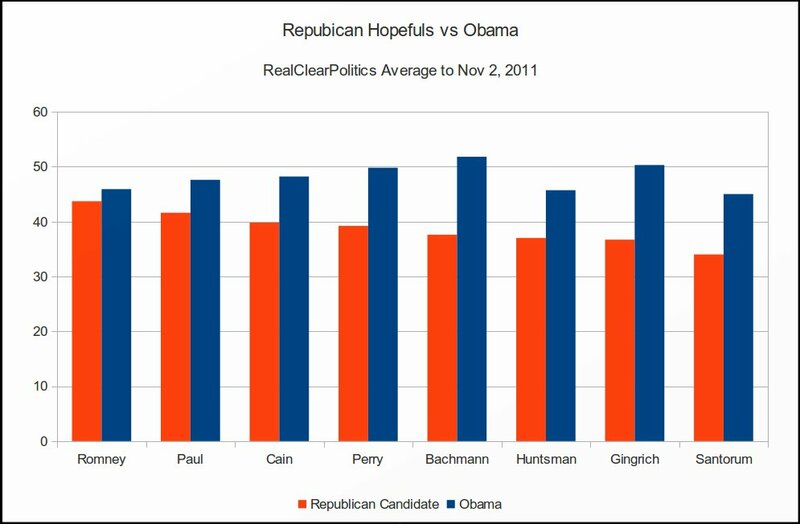 In the latest (to November 2, 2011) average of polls of head-to-head match ups against President Obama, Republican Presidential nominee hopefuls Mitt Romney, Ron Paul and Herman Cain have the greatest chance of defeating the President in the 2012 election. In these polls, Former Massachusetts Governor Mitt Romney would lose to President Obama by 43.7% to 45.9%. Texas Representative Ron Paul, so often overlooked in this contest, is the next strongest contender, losing to Obama 41.6% to 47.6%. In third place is businessman Herman Cain, 39.8% to 48.2%. Perhaps the most interesting statistic in the RealClearPolitics polls is the poll result for a generic “Republican” against President Obama: in this case, the numbers favor the Republican candidate: 44.8% to 41.8%. That seems to indicate that voters are not particularly enamored of the current field of potential Republican nominees. Gotta wonder about that boy’s head! That Ricky’s such a tax and spend fool! Better load your wallet heading out the door! But this ain’t pizza, can’t you see? Energy, Commerce and all the other crud. Think TEFRA was a good idea? And massive spending every year? Is that what Michele wants us to do? And damning the Fed – it New Newt times! And that odd expression – I think he’s got a rash! Huntsman – are you kidding me? And where the heck are the budget cuts? And put the country on a different track? Keep making a mess or clean up the place? And point forty-four to the exit door? Mrs Palin never once cut spending during her tenure as Governor. During Mrs Palin’s first year as Governor, the Alaska state budget remained identical to the prior year, at $17.67bn. During that same year, federal transfer payments to Alaska increased 2.56% to $10.68bn. The next year, the Governor increased spending by 0.57%, while federal transfer payment increased by 2.56%. 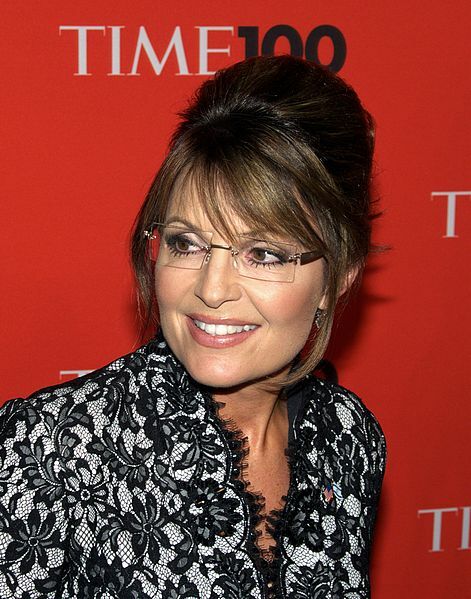 The following year, Mrs Palin increased the state’s spending by over ten percent; 10.57% to be exact (to $19.57bn). That same year federal transfer payments increased yet again, and massively: this time transfer payments from the federal government went up an astonishing 32.4%, to $14.65bn (see below – it seems Mrs Palin’s gift for extracting federal money translated very well from her time as mayor of Wasilla). All state statistics can be found at usgovernmentspending.com; federal payments to Alaska can be found at census.gov. All told, with Mrs Palin at the helm, the state spent 10.75% more by the end of her tenure than it did when she took office. During that same period, federal payments to Alaska by the federal government rose an incredible 40.74%. All those extra dollars, of course, come from the taxpayers. CNN today published a press release on behalf of Sarah Palin. What we mean by “press release” is that the “story” is simply about a speech Mrs Palin is planning to give in Iowa tomorrow, Saturday September 3, 2011. As such, it is a story advising readers that there is a story forthcoming at some future date. The article does, however, speculate (as these articles always do) about Mrs Palin’s ambitions to stage a run to become the President of the United States. The article goes on to state that Sarah Palin will potray herself as an “outsider” to the Washington establishment in the forthcoming speech. The problem Mrs Palin faces, however, is that she is a qualified “tax and spender”. Sarah Palin is the former Governor of a state, Alaska, where an enormous percentage of the population is anything but “outside” government. In fact, 31% of all workers in Alaska are directly employed by government of one level or another (Gallup). Additionally, as the New York Times correctly reports, Alaska received the greatest per-capita amount of the so-called “stimulus”: the equivalent of $3,145 for each man, woman and child. Further, Mrs Palin, as Mayor of Wasilla, hired a lobbying firm which in turn extracted $25,000,000 from the Federal Government. Wasilla is a town of less than 7,000 people, which works out to another $3,571 for every man, woman and child. Sarah Palin’s political background in Alaska (and in fact the entire background of the state she hails from) is almost entirely predicated upon extracting money from the federal government. Here’s a quote from Carl Gatto, Republican, 13th District, Alaska House of Representatives: “I’ll give the federal government credit: they sure give us a ton of money. For every $1 we give them in taxes for highways, they give us back $5.76.” Of course, the extra $4.76 Mr Gatto’s state receives comes out of the pockets of workers in every other state, by way of taxes. At root, Mrs Palin, for all her constitutionalist, small-government rhetoric, is “tax and spend”, provided, of course, it is non-Alaskans paying the bill. A very curious and mixed message indeed. And a difficult position to translate into national policy, where there isn’t a pool consisting of 99.77% of “others” to tax. As Senators John McCain and Barack Obama prepare for Tuesday’s debate, the most recent polls show this debate a must-win for Mr McCain: Mr Obama’s campaign has the momentum with just a month to go before Americans go to the polls and leads McCain in virtually every survey recently conducted. “Would I make a blanket commitment to meet unconditionally with the leaders of each of those countries [Iran, et al] within the first year I was elected President? Absolutely, positively no.” (Contrary to what Mr Biden now says, Senator Obama did indeed state he would meet unconditionally with Ahmadinejad). Next up, Senator McCain needs to attack Senator Obama (and Senator Biden, too) on earmarks and pork-barrel spending, and on this issue, McCain has the opportunity for a very serious body blow: Mr Obama has requested about three-quarters of a billion dollars in earmarks and pet projects during his three years in office. Add in Mr Biden’s one-third of a billion this year alone, and the numbers are shocking against Senator McCain’s history of never having asked for an earmark during his long Senate career. This should particularly play well in the current economic climate: it’s unlikely the American people have much stomach for lavish government spending at a time when they find themselves tightening their financial belt buckles more than a notch or two. The geo-political card should have been Senator McCain’s trump card all along, and Mr McCain needs to get back on message here. He can do so by drawing attention to the agreement Russia and Venezuela recently signed whereby Russia has agreed to provide a loan for the equivalent of one billion dollars to Venezuela for a military/techincal co-operation program. Two Russian Tu-160 long-range strategic bombers also recenty landed in Venezuela, and the countries have agreed to hold joint naval exercises before the year is up. Senator McCain can point to his recent stance on Russia’s invasion of Georgia at a time Senator Obama opted not to interrupt his Hawaiian vacation to respond. In general, Senator McCain needs to press Senator Obama, and press him hard: Mr Obama does not do so well under pressure and without an adoring crowd, and when pressed he often stumbles – his speech becomes very halting as he struggles to find the right way to position his answer. That’s not the mark of a person who knows his positions; rather it’s the mark of a person who knows how his positions should be perceived. Press the “change” issue: in Senator Obama’s short Senate tenure, he’s been anything but a change agent, and has instead obediently voted along party lines. Mr Obama has no history to speak of involving reaching across party lines or defying his party. 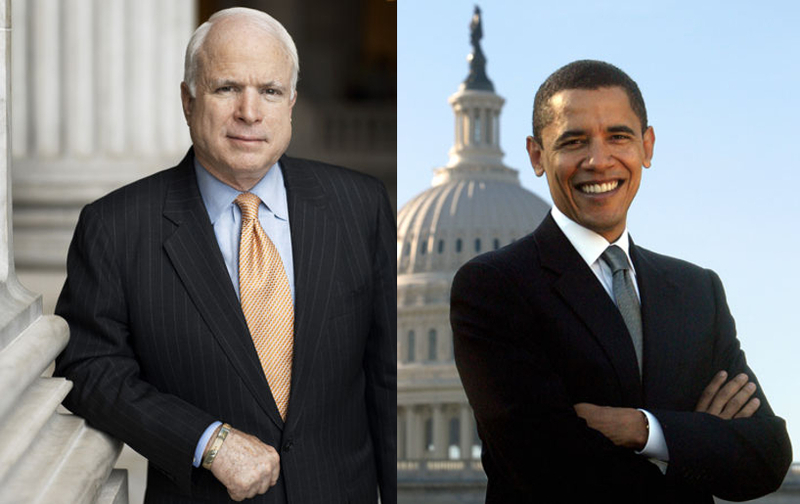 Senator Obama will seek to continue to paint Senator McCain as “Bush Revisited”. The counter-attack to that is simple: the only thing more unpopular than Bush is the Democratic Senate. Mr McCain needs to start painting Mr Obama as an extension of that unpopular legislative body. Pointing out that Senator Obama’s party has had the majority for some time now and have chosen to do not much of anything should be an effective line of attack. Recently, Governor Palin has attacked Senator Obama’s links to William Ayers, the former member of the Weathermen, the group which bombed the Pentagon, the Capitol Building and various police cars etc. Senator McCain would do well to continue to press Senator Obama on his associations: his links to convicted felon Antoin Rezko (Mr Obama’s first political donor and former neighbour; prosecutors of Mr Rezko have requested a sentencing delay and it’s rumored Mr Rezko is on the verge of spilling the beans on corruption in Illinois politics), his twenty-year attendance at the church of Reverend Wright and Mr Obama’s ties to big-money in Washington (Senator Obama’s campaign donations from big money dwarf those Senator McCain (or even Senator Clinton) have received, as we wrote previously). Take the focus off the economy. One easy way to do so is to point out to Senator Obama that there’s only so much influence the government has on the economy in what’s ostensibly a free market, as vividly demonstrated by the impotence of the recent bailout bill. Senator McCain should take a page out of history and point out that the more an economy is managed, the poorer the results for the people – that’s also been very vividly demonstrated in the twentieth century. Follow up, hard, on Governor Palin’s recent message that government is not the solution to every problem but more often is the cause. Refer to Mr Obama as “Senator Obama”. It makes Mr Obama’s somehow jarring familiarity at using “John” for Mr McCain seem all the more odd – like calling one’s father by his first name as a child. In short, Senator McCain needs to come out swinging and put his younger, less experienced opponent on the defensive. Mr McCain has kept himself rather in check thus far. If he plans to close the gap between the two campaigns, now is the time to come out swinging.